Our best partnerships begin with a conversation. That conversation might start at a scientific symposium, a technical meeting, a trade show, or even a simple phone inquiry in response to an opportunity posted on Fermilab’s website. Or, it might be the result of a long-term relationship between researchers at Fermilab and the Partner institution. When that conversation turns into a serious intent to collaborate on something new, it is time to formalize the partnership. A set of terms and conditions that articulate the rights and obligations of each of the parties to the agreement. A well-crafted Statement of Work (SOW) is the cornerstone of all Partnering Agreements. As a prospective Partner, you will work with your technical counterpart at Fermilab (Principal Investigator) to develop the SOW and the budgetary estimates for the work. 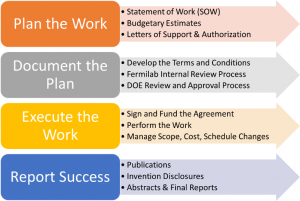 In some cases, the SOW may also be the basis for a joint proposal for funding from DOE SBIR & STTR Programs or from another federal agency. In these cases, the Partner may also need a Letter of Support from Fermilab. 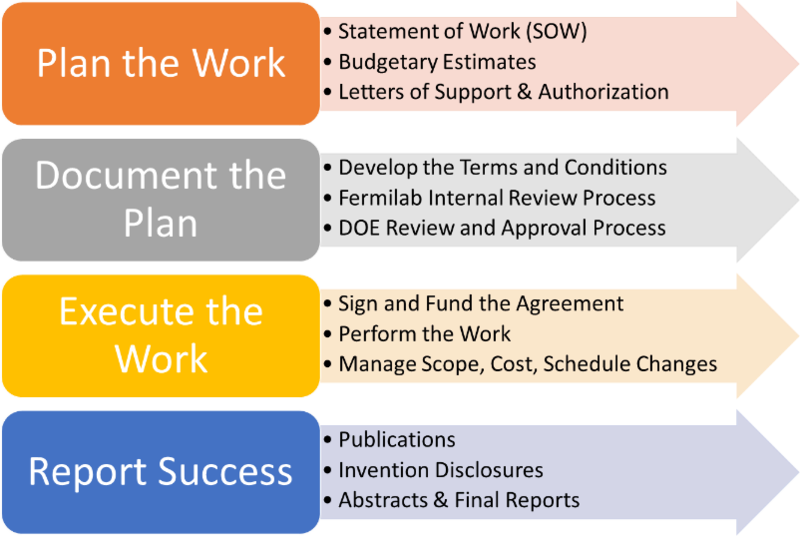 Once the SOW is complete and funding is confirmed, a Partnership Coordinator in the Office of Partnerships and Technology Transfer (OPTT) will work with the Partner to establish the appropriate terms and conditions and guide the Partnering Agreement through the rest of the Fermilab and DOE approval process. Upon execution of the Agreement, the Partner will be provided with additional instructions regarding funding by the Office of Sponsored Programs and Corporate Accounting (SPCA). Finally, the Partner and the Fermilab PI can proceed with performing the work and reporting the results of the project. To learn more about these processes, contact us.